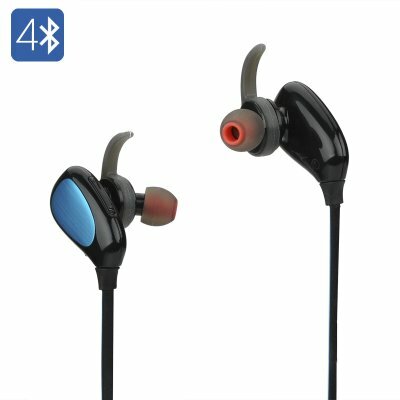 Successfully Added Bluetooth EDR Stereo Earphones - Bluetooth 4.1, Support Noise Reduction, 10M Range, 40 Hours Usage Time Per Charge to your Shopping Cart. Effortlessly listen to music and answer calls where ever you go. Featuring Bluetooth 4.1 these sports earphones connect directly and wirelessly to your phone or other supported device, allowing you to answer calls and enjoy your favorite music without the need of any external cables. Holding a Built-in 130mA lithium battery these Bluetooth Earphones can function for up to a stunning 40 hours on one charge and need less than one hour to be fully charged– bringing along tons of entertainment during your exercise. With its EDR specification, these Bluetooth headphones attain a much higher data rate resulting in an improved performance and delivering a sound quality fit for all the audiophiles out there. It’s high-quality earphones feature noise reduction as to ensure that no outside noise will distract you and interrupt your music listening experience or phone calls. Coming with a range of different ear plugs and an ear-hook design these EDR earphones are guaranteed to fit anybody. Keep your phone in your pocket or backpack and listen to music during your exercise without the nuisance any unnecessary cables. The next time you hit the gym or go out for a run bring along these stylish and top-grade Bluetooth Sport Earphones. Once paired to your smartphone you can work out while enjoying all your favorite tracks and even answer phone calls without the need to interrupt your exercise regime. These Bluetooth EDR Earphones comes with a 12 months warranty, brought to you by the leader in Bluetooth Earphones as well as wholesale electronic gadgets..
Arabic: - 4.1 سماعة بلوتوث - Chinese Simplified: - 4.1 蓝牙耳机 - Czech: - 4.1 Bluetooth headset - Dutch: - 4.1 Bluetooth-headset - French: - 4.1 oreillette Bluetooth - German: - Bluetooth 4.1 Headset - Hebrew: - 4.1 אוזניית Bluetooth - Hindi: - 4.1 ब्लूटूथ हेडसेट - Hungarian: - 4.1 Bluetooth fejhallgató - Italian: - 4.1 auricolare Bluetooth - Japanese: - 4.1 ブルートゥース ・ ヘッドセット - Korean: - 4.1 블루투스 헤드셋 - Malay: - 4.1 set kepala Bluetooth - Norwegian Bokmål: - 4.1 Bluetooth hodetelefonen - Romanian: - 4.1 setul cu cască Bluetooth - Russian: - 4.1 Bluetooth-гарнитура - Spanish: - 4.1 auricular Bluetooth - Thai: - 4.1 ชุดหูฟัง Bluetooth - Turkish: - 4.1 Bluetooth kulaklık - Vietnamese: - 4.1 tai nghe Bluetooth.